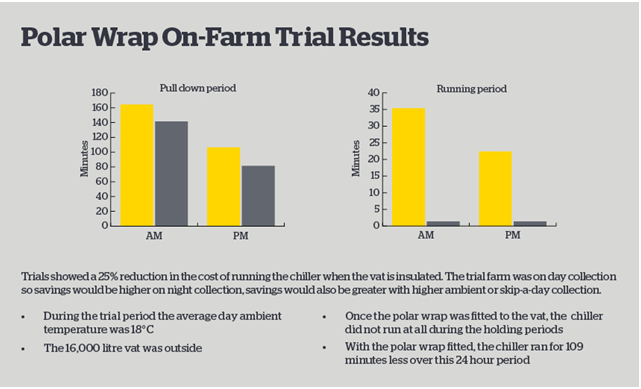 Polar wraps have been designed to decrease the unit run time by reducing heat transference and therefore reducing cooling costs by up to 25%. Saves power up to 25% of chiller unit running costs. Russell Corfield’s best practice installation stipulates that the milk vat must be empty to achieve optimum results. Due to health and safety concerns the vat will only be installed when the weather is fine. We endeavour at all times to ensure that the wrap fits neatly on the vat and our technician will discuss with you the ramifications where we need to cut off some items of stainless. This is done to improve the installations durability and appearance. These wraps have been designed for the new style vat and consequently when we are required to fit an older style vat, we must adapt our install method (especially around the manway door) to ensure the best appearance that we can.